"A Tag is a high-capacity color bar code... Organizations and individuals can create specific Tags by using the Microsoft Tag Manager Web service. When the Microsoft Tag Reader application is installed on a mobile device, [it] can be used to scan a Tag using the built-in device camera. When a Tag is scanned by the Tag Reader, the information encoded into the Tag becomes available on the mobile device." rendered with adequate size and detail so it may be scanned accurately by mobile device cameras. The purpose of this was not obvious to me. I had to approach it in steps. Let's start by defining a tag as a descriptive word or phrase associated with a noun, verb or idiom. I think of these as basic "virtual tags". Examples would be the word or word expression description associated by customers with Amazon.com merchandise. Since my own cognitive processes are driven by analogy to basic concepts learned, well, in elementary or middle-school, I think of a tag as a super-synonym. Better yet, a tag is a synonym with a promising future. Virtual Tags describe people, animals, objects and actions, but are applied within the virtual world, usually the internet. 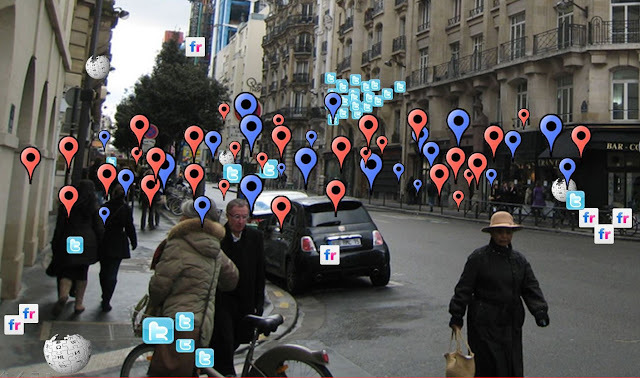 Virtual Geo-tags are specific to physical location, and usually correspond to geo-spatial coordinates (GIS). Examples are the inverted teardrop place markers used to indicate locations in Google Maps and Mapquest. This type of tag is a virtual construct, despite its reference to a physical location. Microsoft Tags are physical objects. They are associated with specific geo-spatial data, i.e. geographical locations in the real world. Using the Microsoft tag reader and a mobile phone camera, these physical Microsoft Tags can then be converted to Virtual Geo-tags. Comprehension increases after viewing the image gallery of Microsoft Tag examples created by current users, or the implementation guide for web and mobile phone users. The latter is available as a PDF download. Microsoft is offering its Tag service free of charge. They make no promises about the future though. "a hybrid place: the online extension of the socially constructed human landscape in which the lines between material place and digital representations of place blur." The internet is evolving at a brisk clip. The image above, which seemed fanciful a year ago, is growing into a reality with QR codes and now Microsoft Tag.